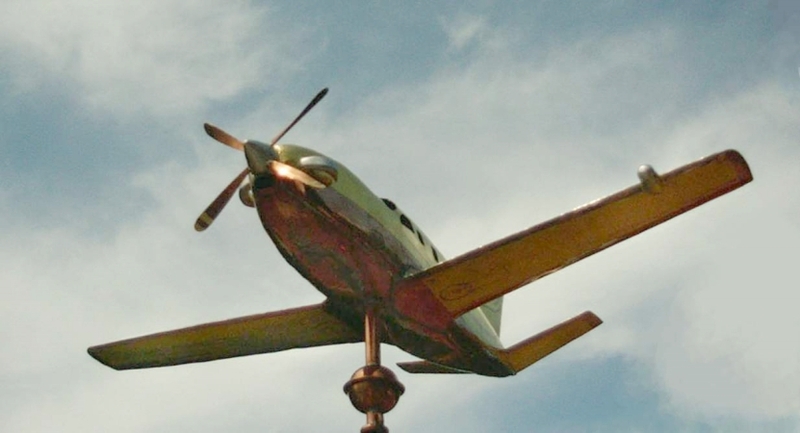 Our Socata TBM 700 Airplane Weathervane is a 3D replica of the original French USA collaboration. 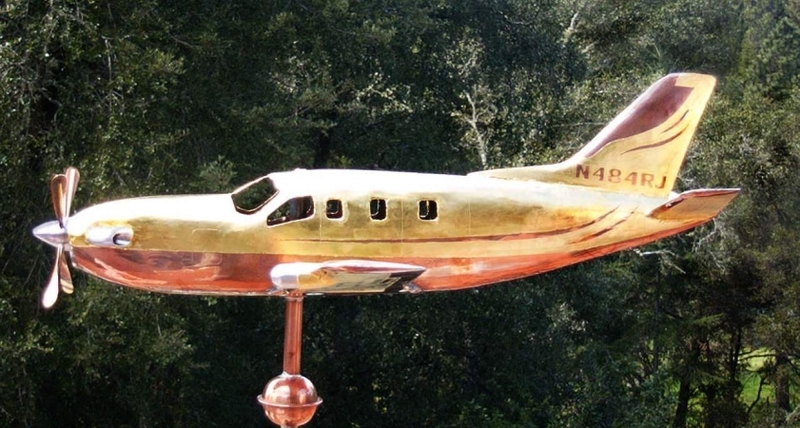 As pictured, this commission also included optional gold leaf to both replicate the custom paint job our customer enjoyed so much on his plane and to illustrate the wheels, wing flaps and tail number. As the vane weathers through the chocolate tones and then patinas this gilded design will remain bright and create a very effective contrast. 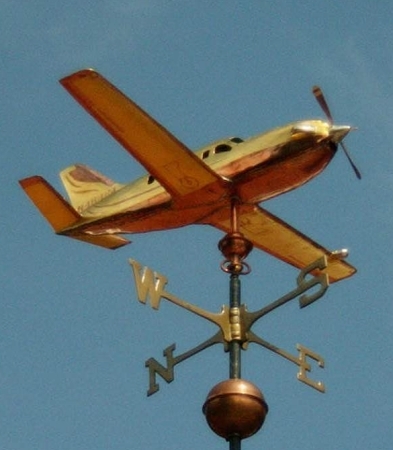 There is also an ‘eared’ security device on this vane to prevent ‘lift off’ in high winds. 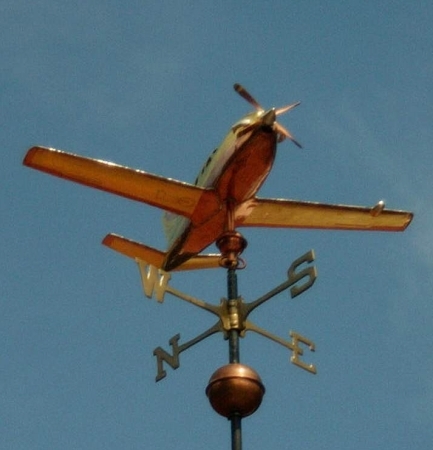 We install a security device on any vane that has a sail element to it, be it a kite, a sail boat, or a bird on the wing. We will sometimes add a precautionary security device because the installation location is prone to intense winds. 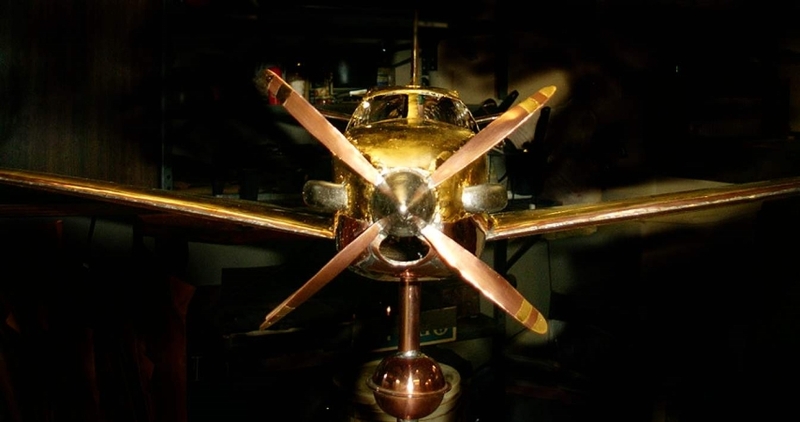 In the early 1980s, the Mooney Airplane Company of Kerrville, Texas designed a six-seat pressurised light aircraft powered by a single 360 hp (268 kW) piston engine, the Mooney 301, which made its maiden flight on April 7, 1983. 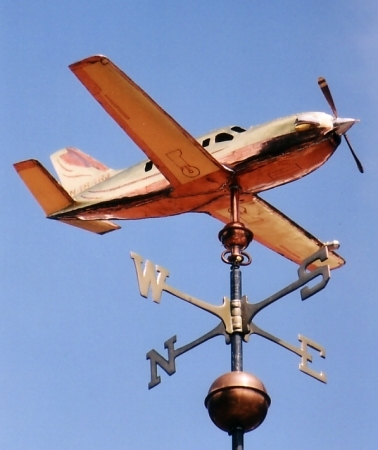 Mooney was purchased by French owners in 1985, which resulted in talks between Mooney and the French company SOCATA to build a turboprop derivative of the 301. The result of these discussions was the TBM 700, which was much heavier than the 301 with more than twice the power, with a joint venture, TBM International, being set up in June 1987 between Mooney and Socata’s parent company Aérospatiale to design and build the new aircraft. 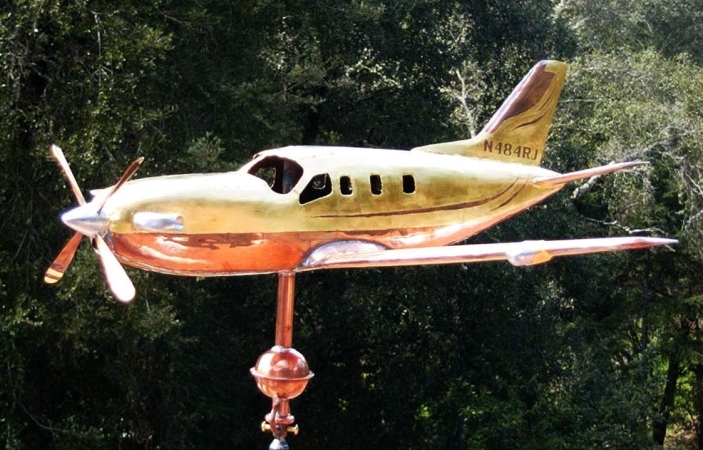 In the designation TBM, “TB” stands for Tarbes, the city in France in which Socata is located, the “M” stands for Mooney. The TBM 700 is a single-engined turboprop, six to seven-seat low-wing monoplane of mainly aluminium and steel construction, but with the tail surfaces built of Nomex honeycomb. It has a retractable tricycle landing gear and is powered by a Pratt & Whitney Canada PT6A-64 engine delivering 700 shp (522 kW). The first prototype TBM 700 made its maiden flight on 14 July 1988, with French certification following on January 31, 1990 and US Federal Aviation Administration (FAA) certification achieved on August 28, 1990. 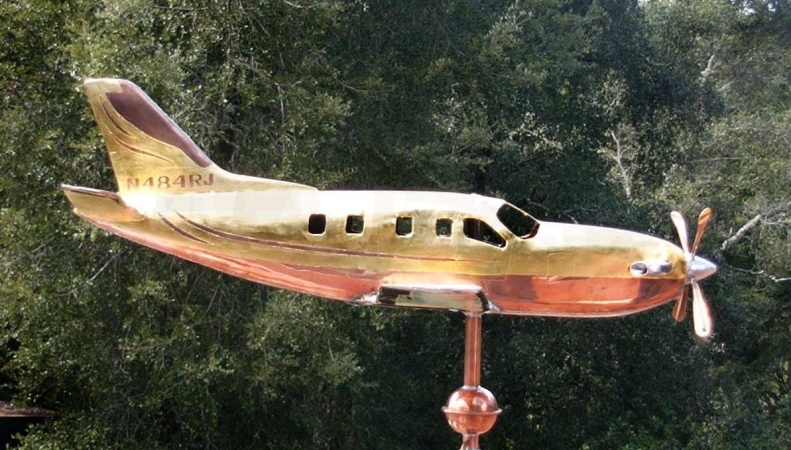 Our most experienced vane makers work on our fully three dimensional pieces, and thoroughly enjoy any new challenges that use their many talents. Do call if you have a piece you would like replicated.